I'd like to run friday nights still but if it ends up being too cold for a lot of people we can do sundays instead. Looks good to me. Are you still planning on running oval Friday nights? Maybe Sundays? Ok oval racers I have some great news. We will be racing all year round @ Delta! 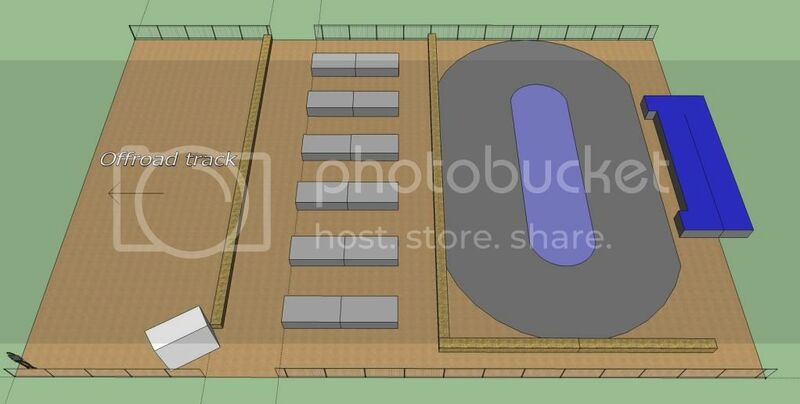 Here is a drawing I made up of the proposed layout in the arena this winter. Keep in mind that this only shows 1/2 of the total arena and the offroad track will remain the same size its always been before. The oval is going to be a smaller one but im sure it'll bring even closer, more exciting racing. Check it out!!! Yah it has been raining this morning. Good call there Hopper! Well we had some rain last night end there is an 80% chance @ 5pm which increases to 90% by 8pm. I have to say its not looking good and at this point even if it were to not rain (10% chance) no one would likely show up since they made other plans etc. Im just as bummed as anyone believe me. Good news is that I have some plans drawn up for an oval under the arena and we are starting general work there today. 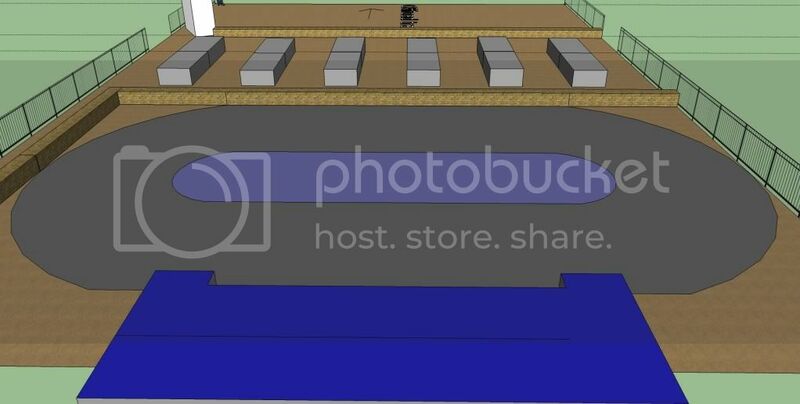 Still not 100% set in stone but to me it looks like we should be able to make it happen. More details will be available sometime tomorrow most likely. I want to thank everyone for their support and please hang in there until we are able to figure our winter situation out! The weather forcast isn't looking to good for this Friday either ! Will we ever get to race oval again ? If only we had a roof. No prob Sherm. Of course it ends up not raining another drop. Its def getting cold outside thats for sure! I was thinking it is going to be hard for me to get there tonight work and all. Hope we have a race on the 16th or 23rd? Frank was thinking he could make the 23rd , But that is thanks giving weekend and was not sure you would be open. Thanks for giving it a shot Hopper.. I hope to run on the clay soon.. maybe we should pitch in for cover... or roof like the indoor track. Let hope next week we can run on the Delta Dirt Oval.. Guess we see you guys @ LSR tomorrow. I'm going to call the oval race for tonight. The lake on the track is being pumped now but with a 50% chance of more rain till tonight and the cold weather the track will most likely not be dry enough in some areas. I don't want racers to make the trip for nothing, or come out with the risk of being rained on. Sorry folks! Is it on like donkey kong tonite? Strreet Tracs are 3.5" dia. I am at 18/62 with the larger tires. That is about right. Thanks Sherm! There is no Machine like a Sprint Car — Turning Right Go Left! EDM is ready. Somewhere around here I have about a half a gallon of nitro fuel last used at Brentwood Racing Club, is it worth looking for or is it too old and no good?